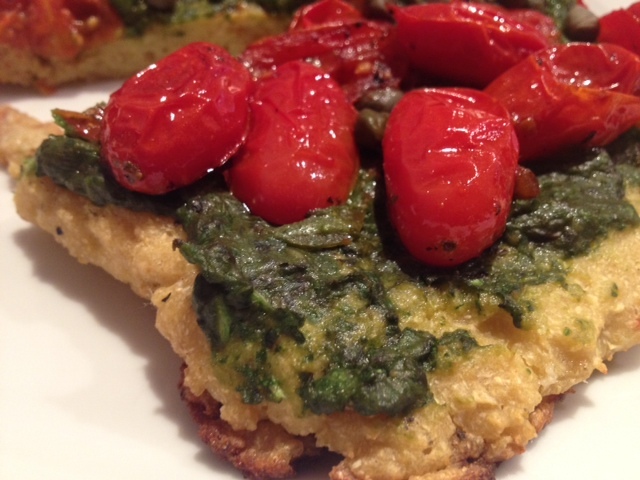 Gluten-Free Cauliflower Pizza Crust Topped with Spinach, Arugula & Avocado Pesto, Capers & Roasted Grape Tomatoes. 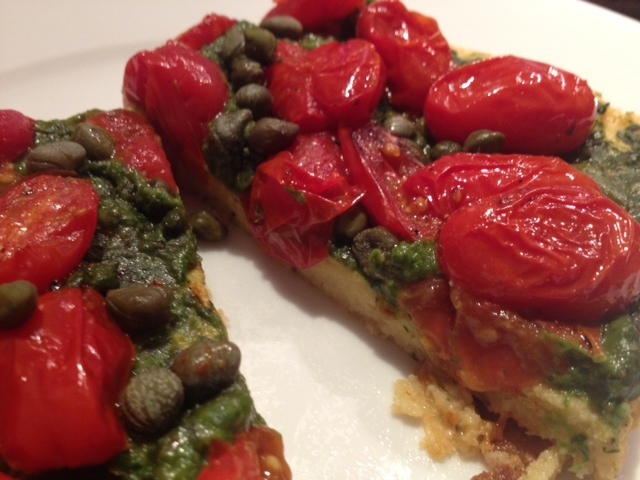 This cauliflower pizza crust is a great option for gluten-free pizza lovers, but is also a delicious and healthy option for anyone! This recipe was passed along to me from a family member and I couldn’t wait to give it a try. 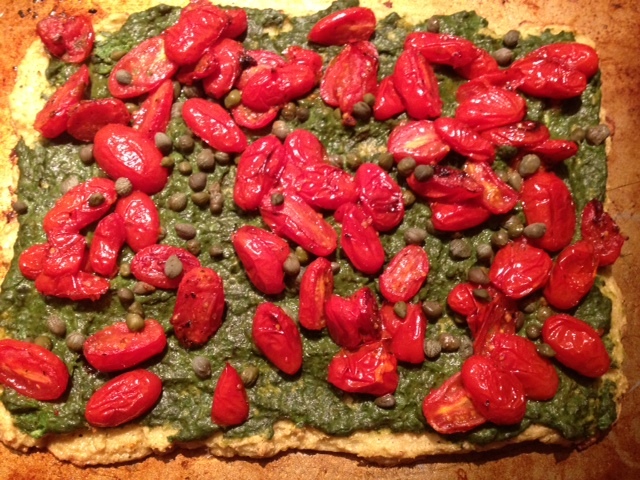 I made very slight changes to recipe for the crust and then picked my own toppings. You can top it with anything you’d like. I’ve made it a couple of times and once made it topped with tomato sauce, prosciutto and pine nuts which was also delicious. The crust is firm, crispy and has a great texture. 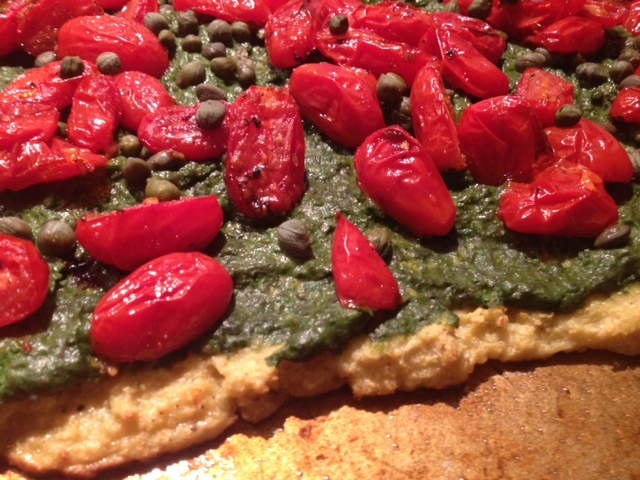 You will definitely be surprised at how good cauliflower pizza crust can taste! 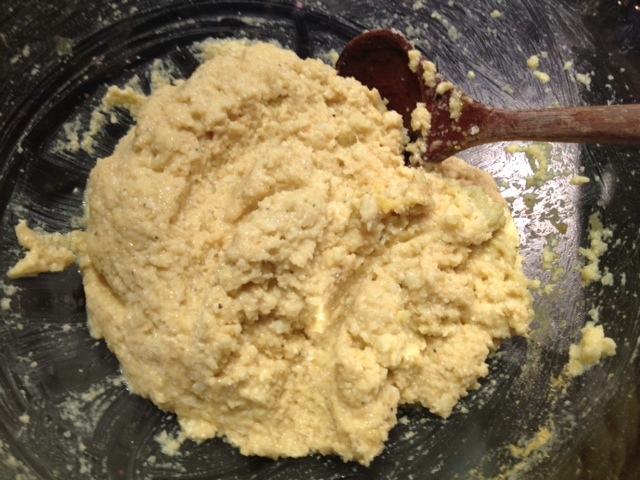 Begin by putting the cauliflower into your food processor. It’s easiest to do 2 batches rather than put all of the cauliflower in at once. 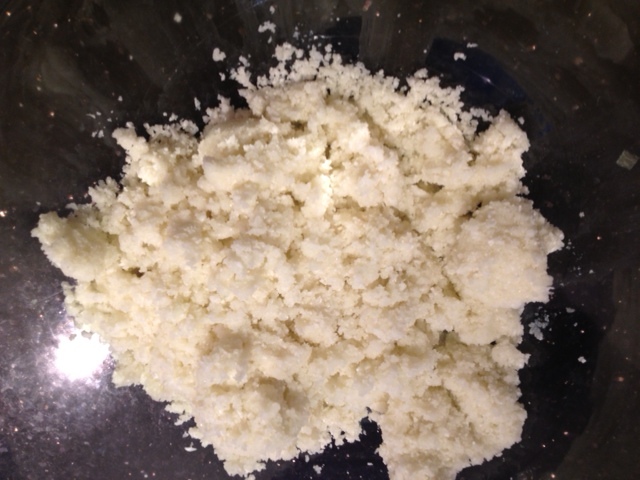 Blend until it is a light consistency and all the big lumps are gone. 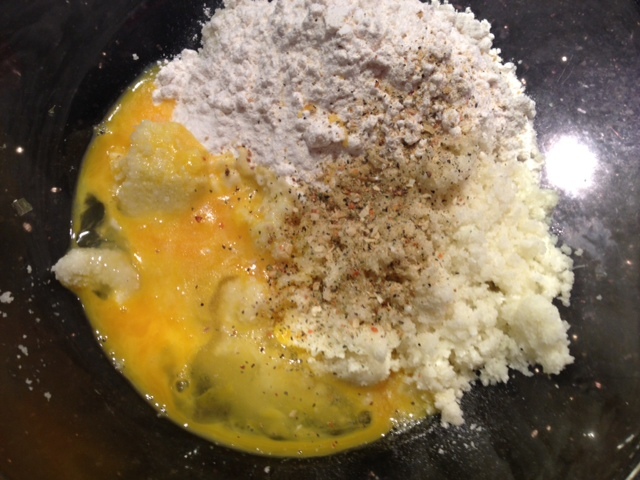 Place the cauliflower into a large mixing bowl and add the eggs, garlic, nutritional yeast, flour, garlic salt, black pepper and herb mixture. Mix well to combine all of the ingredients. 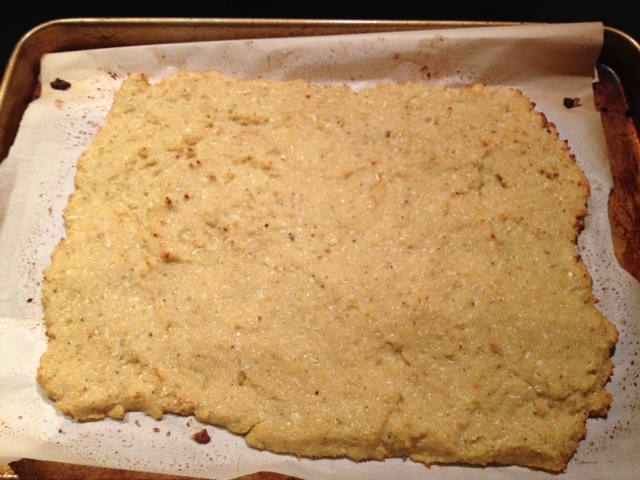 Place parchment paper down a baking sheet and pour the dough onto it and use the flat side of a spatula to help mold the crust into the right shape. I molded mine to be a (fairly lopsided) rectangular shape. Place the crust in a 450 degree oven for 30 minutes. 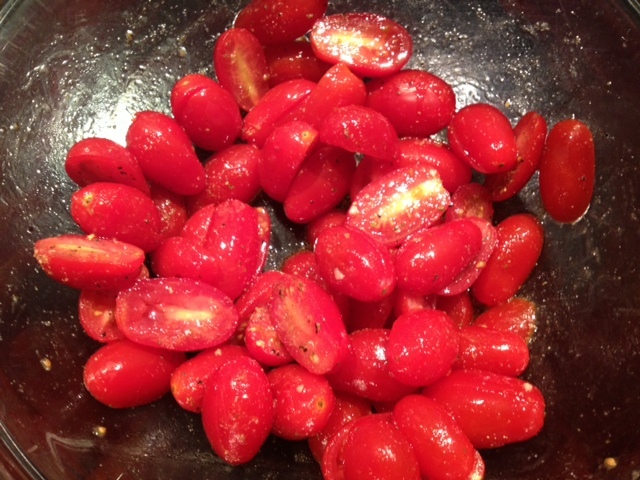 Toss the tomatoes with 1 tbsp olive oil and place onto a baking sheet. 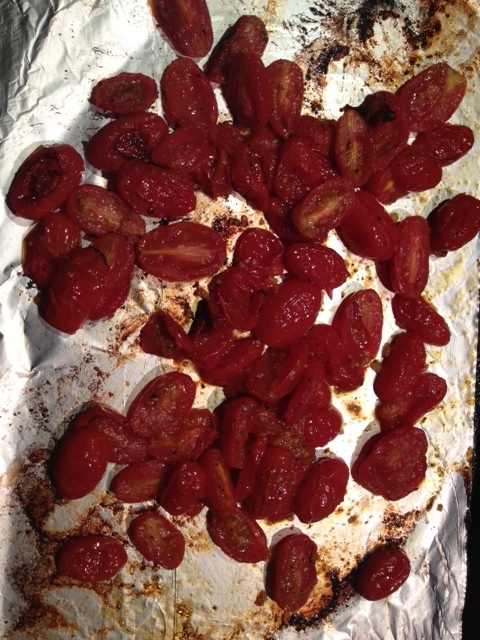 Season lightly with garlic salt/black pepper and place in the oven with the crust (at 450 degrees) for 20 minutes. 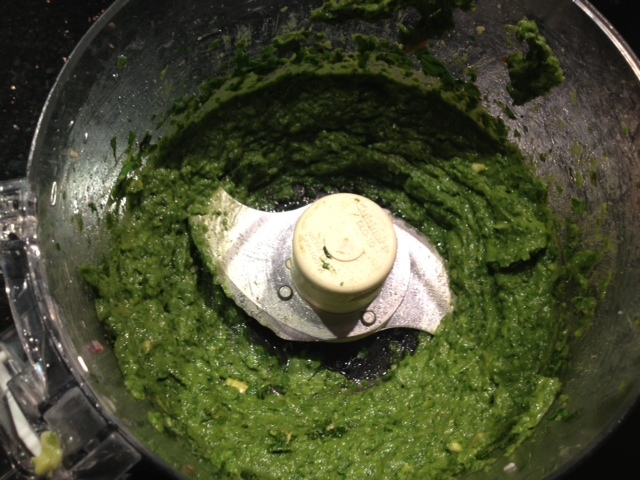 While everything is in the oven, put the spinach, arugula, basil and avocado into the food processor and blend until it’s a smooth consistency. Season with a dash of garlic salt and black pepper. 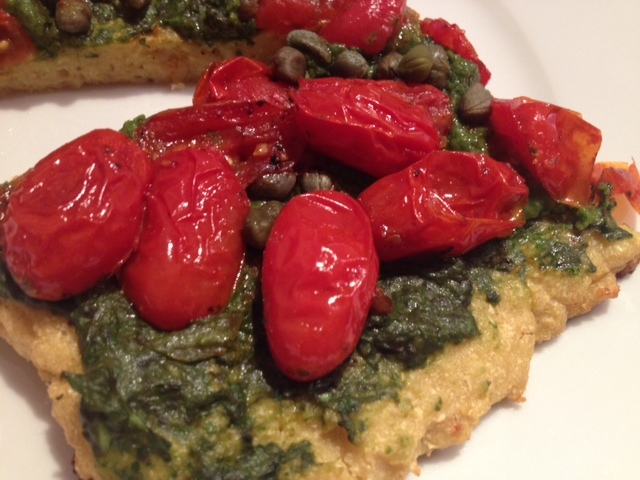 After the crust and tomatoes are done cooking, remove them from oven and top the crust with the pesto, roasted grape tomatoes and capers. Put this back into the oven and cook for an additional 10 minutes. ← Gluten-Free/Dairy-Free Creamy Veggie Spaghetti.